Miranda Kenneally is another one of my auto-buy authors. I absolutely love her Hundred Oaks series and impatiently wait for the next book to come out each year. I was over the moon to receive an e-ARC of Defending Taylor, but decided to wait to read it as a post-finals/post-semester treat. However, after a particularly upsetting day, I knew a Miranda Kenneally book was what I needed to help me feel better, and I was not mistaken. Taylor Lukens is the daughter of Tennessee’s senior senator. She is the captain of her soccer team, makes perfect grades, and even participates on the debate team—all to make it into Yale, her father’s alma mater. Taylor has a great shot of being accepted…that is until she makes one mistake. Kicked out of her boarding school, Taylor returns home and starts school at Hundred Oaks High, where she has to start over and try to make up for her one mistake. Miranda Kenneally has a way of pulling you in with each story. Taylor made one mistake. One mistake to save her boyfriend from expulsion and instead she was the one expelled. Now Taylor has to deal with the disappointment of not only her parents and older siblings but also the media, who tries to use her mistake against her father’s reelection campaign. It’s easy to relate to Taylor as she tries to gain control of her life again. We’ve all been in her position, albeit not on as large as a scale. We’ve all made mistakes and choices that we’ve regretted. We can’t take them back so we must move forward from them. As Taylor adjusts to her new school, she has to deal with the fact that her resume will look terrible now. She’s lost her soccer captainship, she’s no longer on the debate team, and now she’s taking lower level classes since none of the higher ones are offered at Hundred Oaks. However, with this lighter load, Taylor’s not as stressed and overwhelmed about school. Through this experience, she learns that it’s okay not to be perfect. Taylor also learns about herself and what she actually wants. Her dream was to go to Yale, major in business, and one day take over her grandfather’s business with her older siblings because that was what she was supposed to do. However, her real passions are museums, soccer, and animals. She discovers that she doesn’t have to follow in her father and siblings’ footsteps. She has the ability to pursue her passions and make her own dreams. 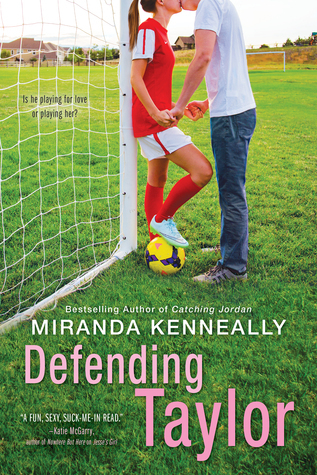 Defending Taylor wouldn’t be a Miranda Kenneally book if there wasn’t a swoon worthy romance. Ezra is Taylor’s older brother’s best friend. Taylor has had a crush on him forever, but after he stood her up on her sixteenth birthday, she’s written him off. That’s until she’s back home and runs into Ezra, who has taken a semester off from his Ivy league school and is now working in construction. They start talking again and she finds out the real reason why Ezra didn’t show up to her birthday party, which has to do with his learning disability his parents have kept hidden and ignored. Their relationship develops as they share secrets, and I loved how they push each other to do what’s best for theirselves. Overall, I loved Defending Taylor and definitely recommend it. Fans of Miranda’s previous novels, especially Racing Savannah, will love the cameos of some past characters! This looks like a really good book! I always love books that feature soccer players. I’ve been looking for a swoony read for the start of summer, and your review convinced me that this might be the one! Thanks for sharing! Thank you! I hope you enjoy Defending Taylor! You’ll have to let me know what you think!